VICTORY NEWS: BOMBAY DUCK HAS BEEN SAVED!!!! Following my request, the Indian High Commission approached the European Commission about the ban. The EC adjusted the regulations so that the fish can still be dried in the open air but has to be packed in an "EC approved" packing station. Now a Birmingham wholesale merchant has found a packing source in Mumbai/Bombay and the product is again available. Wholesale supplies can be obtained from Mr Evans, J Vickerstaff Co Ltd, Wholesale Market Precinct, 27 Pershore Street, Birmingham B5 6UB. Tel: 0121 622 1827. PLEASE ASK YOUR LOCAL CURRY HOUSE TO ORDER A SUPPLY! sales@sweetmart.co.uk, or telephone 0117 9512257. Filleted Bombay Duck fish @ £17.00 per kilo (including air couriers' charges). Send a postal order/money order in the name of : Mr. Suryakant D. Bhagat. The supplier can be contacted as detailed below. FAX : 91 260 2373336. Supplies are now appearing in Indian Cash-and-Carry warehouses. CELEBRATION T-SHIRTS: Send a cheque for £15.00 for an XL Tee shirt with the Bombay Duck logo to D.T.Delaney, Mortimers Cross Mill, Leominster, HR6 9PE. In 1997 Bombay Duck was banned by the European Commission (EC) of the European Union. Bombay Duck is a delicacy eaten as an accompaniment to curry. 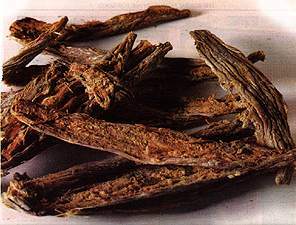 It is dried fish that is usually served fried. It has an acquired pungent taste adored by curry lovers. The EC admitted that it had no "sanitary" evidence against the product and the UK Public Health Laboratory Service confirmed that there are no recorded cases of food poisoning, or bacterial contamination, associated with Bombay Duck. It was been banned because the EC only allows fish imports from India from approved freezing and canning factories. Bombay Duck is not produced in factories. Bombay Duck - an acquired taste but worth saving! EC & UK Propaganda-"economical with the truth"
Site produced by David Delaney. I have had to remove my e-mail address as it has been seized by spammers. For me EU the ban on Bombay Duck was a ban too far! So much of what we love is banned without question that I decided to fight this one. (It is a good example of what happens when we allow bureaucrats in Brussels to make our laws). The solution to lifting the ban was so simple, why did the bureaucrats and government ministers refuse to see it? They could have been heroes, instead they chose to be villains. This Euro-sceptic Web Site is run by David Delaney.